Hot issues within the baking and snack food markets. Find out how bakers and snack producers define new opportunities for growth within a category. Snack food categories like chips, crackers, frozen snacks/appetizers, nuts/trail mixes, popcorn, pretzels, puffs/extruded snacks, popped snacks and tortilla chips, including trends, ingredients, products, packaging, equipment and formulation strategies. Bakery and baked goods categories like bars, breads (bagels, buns, rolls, biscuits and loaf breads), cookies, desserts (cakes, cheesecakes and pies), muffins, pizza, snack cakes, sweet goods (doughnuts, Danish, sweet rolls, cinnamon rolls and coffee cake) and tortillas. The latest in machinery, technology, materials and systems. Prevailing and emerging trends in snack and bakery including and related to artisan, better-for-you, clean label, flavor trends, food safety, gluten-free, plant efficiency, portion control and sustainability. Check out what companies are doing to get the most of their production line. 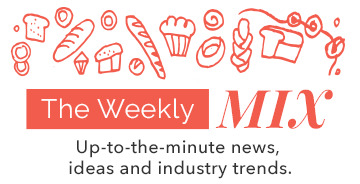 Our industry columnists discuss news, issues and industry observations that bakers and snack manufacturers need and provide details and observations from the production floor or news on industry happenings. Receive up-to-date information from equipment and ingredient suppliers.